I love to make Christmas cookies, and there are some adorable recipes to choose from. Here are five cute recipes that you can make use of this holiday season. Each has a link to the page where I found the recipe, in case you would like more detailed instructions and more pictures. This recipe makes 32 cookies and takes a total of 55 minutes. 1. Heat oven to 350. Break up the cookie dough in a bowl, add flour until blended. Roll dough into a log, and then make into a triangle shape. 2. Cut dough into 32 triangular slices – 1/4 inch thick. Place 2 inches apart on an ungreased cookie sheet. 3. Bake 7 – 11 minutes, or until set. Cool for 1 minute and then move to cooling rack. Cool completely – takes about 15 minutes. 4. Frost the cookies with frosting. 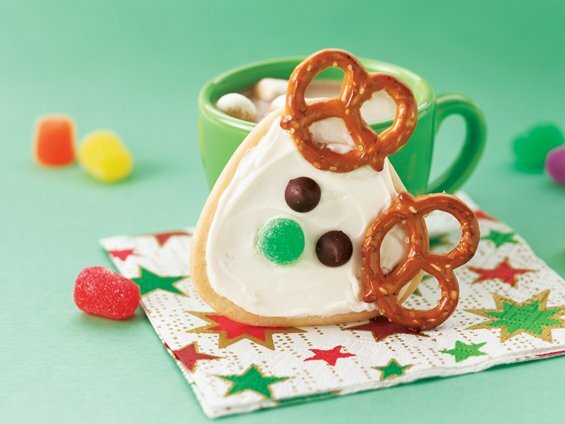 Place two pretzel twists on each triangle near the corners for antlers. Press two chocolate chips into the frosting to make eyes, and 1 half of a gum drop to make a nose. To store: place between sheets of wax paper in a tightly covered container. This recipe makes 18 cookies, and takes a total of 1 hour 50 minutes. 1. Heat oven to 400. Beat butter, sugar and lemon with an electric mixer on medium, or with a spoon. Stir in egg and milk. Stir in flour, baking powder, baking soda, and salt. 2. Place dough in rounded teaspoonfuls full 3 inches apart on ungreased cookie sheet. Use the bottom of a drinking glass to make each about 1/4 inch thick and 3 inches in diameter. Bake for 8 – 10 minutes or until light golden brown. Move immediately from sheet to wire rack. Cool completely – about 30 minutes. 3. 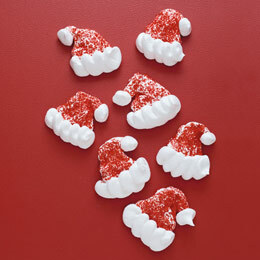 Spread frosting on one cookie, then sprinkle red sugar over the top 1/3 of the cookie to make Santa’s hat. Press on a mini marshmallow for the hats tassel. Press 2 chocolate chips for eyes, and 1 Cinnamon candy for nose in the middle third of the cookie. 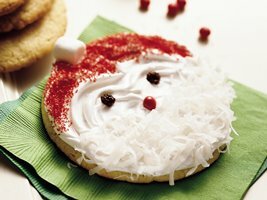 Then sprinkle the coconut on the bottom third of the cookie for Santa’s beard. Decorate one cookie completely before moving on to the next so that everything sticks. This recipe makes 26 cookies and takes a total time of 1 hour 20 minutes. optional: marshmallow cream to stick together marshmallows if they do not stick on their own. 1. Line a baking sheet with foil, butter the foil and set it aside. In a small sauce pan combine the carmels, condensed milk, and butter. Heat and stir over medium low heat, until melted and smooth. 2. Use kitchen scissors to cut 1/3 of the marshmallows in half crosswise. Place the marshmallow half sticky side down on top of another whole marshmallow to form the head and body. Press gently together to get them to stick, use marshmallow cream if needed. To make arms – stick two pretzel sticks into each side of the whole marshmallow. 3. Dip the bottom 1/3 of the snowman body into the carmel mixture, allow excess to drop off. Place onto foil. 4. Put pistachios, coconut, toffee pieces, and/or nonpareils into separate bowls. In another sauce pan, combine the chocolate and shortening. Heat and stir chocolate mixture over low heat until melted and smooth. 5. Dip the caramel coated end of each snowman into the chocolate, enough to cover the caramel. Allow the excess to drip off, then dip into one of the bowls of pistachios, coconut, toffee, or nonpareils. Put snowman back on baking sheet, and let stand for 30 minutes or until the chocolate is set. 6. If necessary, remelt the chocolate over low heat in a sauce pan. Put the snowmen onto their backs to finish decorating. 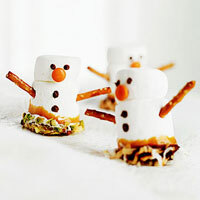 To make eyes and buttons, dip one end of a pretzel stick into the chocolate and then dab onto the snowmen. To make a nose, dab on some chocolate and attach a small piece of candy. Let stand until dry, about 5 minutes. Makes 2 dozen santa hats. 1. Heat oven to 200 degrees F. Beat the egg whites with an electric mixer until soft peaks start to form. While continuing to beat the mixture, add the tartar, vanilla, and then slowly the sugar. Continue to beat until the peaks are stiff. 2. Line a baking sheet with parchment paper. Spoon the meringue into a quart size plastic bag. Snip off a corner and pipe 2 dozen 1 and 1/2 inch tall santa santa hat triangles onto the parchcment paper. You should have about 1/4 of the meringue left. 3. Sprinkle the triangles with the red sugar, and then use the remaining meringue to make the pompom on the end of the hat and the trim. Bake the hats until hard but not brown, about 1 hour and 2o minutes. Turn off the oven and then leave inside the oven for another hour to crisp the cookies before removing. This receipe reuires you to make the cookies and then gives detailed instructions on how to decorate them. 1. Cream butter and sugar until fluffy. 2. Add mollassess, water, cinnamon, ginger, cloves, and pepper – mix until combined. 3. In a seperate bowl whisk together flour and baking soda. Slowly add to batter in three parts, mixing after each part is added. 4. Roll the dough until 1/4 inches thick between sheets of wax paper. Refrigerate 30 minutes. Then cut into circles and refrigerate another 30 minutes before baking. You can make circles of varying size, but bake those of the same size together. 5. Bake for 8 to 10 mintues at 400 degrees F on a parchment paper or Silpat lined baking sheet. 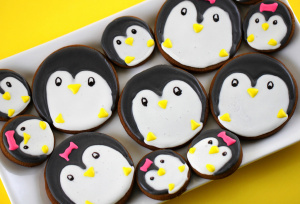 Once cooled, the cookies can be decorated. Be aware that this will take a long time because once the black icing is done, the cookies have to dry overnight before the white icing can be done.